Premature newborns commonly receive non-invasive respiratory support, such as continuous positive airway pressure (CPAP), delivered by a face mask in the delivery room. This requires the infant to breathe for itself, but if it does not, positive pressure ventilation (PPV) is applied. However, this approach has a high failure rate, necessitating premature newborns to be invasively intubated and mechanically ventilated. Importantly, CPAP has been implemented into clinical practice without any understanding for how it interacts with the changing physiology at birth. Before birth, the fetus closes its larynx when it is not making breathing movements (is apneic), which blocks anything from entering or leaving the lungs, and only opens the larynx when it makes breathing movements. We hypothesised, if the newborn is not breathing, it will close its larynx and prevent air from entering the lung. Using phase contrast X-ray imaging, we imaged the larynx of premature newborn rabbits to determine whether the fetal pattern of larynx closure persists after birth. We showed that immediately after birth the larynx is predominantly closed and only opens during a breath, preventing PPV from ventilating the lung. Once the newborn had aerated its lungs and established a stable breathing pattern, the larynx remained predominantly open, allowing PPV to ventilate the lung. These findings provided first understanding for why CPAP can fail in premature newborns in the delivery room. To understand why the larynx switches from mostly closed into a predominantly open state after birth, we investigated the role of oxygenation. We showed that hypoxia is a potent inhibitor of spontaneous breathing and causes the larynx to close, whereas oxygen stimulates breathing and opens the larynx. Our ongoing work is aimed at generating the evidence required to target interventions that improve the success of non-invasive respiratory support for premature newborns in the delivery room. Premature newborns have difficulty aerating their lungs and so most require respiratory support in the delivery room. Although the majority of premature newborns breathe at birth, their breathing is often weak and insufficient to adequately aerate the lung The global burden of preterm birth. The Lancet, 2009, Elsevier.. Lung aeration is the key mechanism underpinning the transition to newborn life as it initiates the changes essential for independent life, including the onset of pulmonary gas exchange and a major re-organization of the circulation. Thus, targeting mechanisms that promote lung aeration will improve outcomes for premature newborns. Historically, premature newborns were given invasive respiratory support with endotracheal intubation and mechanical ventilation, which is associated with a high risk of lung and brain injury. More recently, clinical practice has moved towards a less invasive approach involving continuous positive airway pressure (CPAP) delivered via a face mask to support spontaneous breathing. CPAP assists with inspiration and provides a distending pressure to the lung during expiration to prevent collapse of the airways between breaths. If CPAP is insufficient, intermittent positive pressure ventilation (iPPV) also delivered via a face mask, is used as a "back-up" for CPAP to provide artificial breaths to the newborn. However, non-invasive respiratory support has a high failure rate and often is unable to meet the respiratory needs of premature newborns. This places them at higher risk of mortality and morbidity and often necessitates the escalation of treatment that involves endotracheal intubation and mechanical positive pressure ventilation (PPV) Dargaville, P. A., et al. : Incidence and outcome of CPAP failure in preterm infants. Pediatrics, 2016, 138(1): e20153985.. These methods have been implemented into clinical practice without any understanding for how it interacts with the infants changing physiology at birth during its transition from fetus to newborn. In the delivery room, mask leak or airway obstruction (caused by incorrect face mask or head positioning) were thought to be major causes of CPAP failure to ventilate the lung. However, it was observed that when premature newborns were given a sustained inflation at birth (a long and slow first breath to improve lung aeration), air only entered the lung if the infant took a breath, indicating that the upper airway may be involved in obstructing the air flow van Vonderen, J. J., et al. : Effects of a sustained inflation in preterm infants at birth. The Journal of Pediatrics, 2014, 165(5): 903-908 e1.. Using propagation-based phase contrast X-ray imaging at the SPring-8 synchrotron in Hutch 3 of BL20B2 (long-term proposal 2016A0132) we focused our attention on non-invasive ventilation and simultaneous imaging of the lung and the larynx in spontaneously breathing premature newborn rabbits. A Si(111) monochromator was used to produce high intensity, monochromatic X-rays (24 keV). Immediately after being delivered by caesarean section (29 days gestational age, term = 32 days), premature rabbit pups were placed inside the experimental hutch approximately 210 m from the BL20B2 bending magnet. A further 2 m distance separated the pup from the detector to achieve phase contrast to image the lung and upper airway. This project aimed to understand why non-invasive respiratory support, in the form of both CPAP and PPV, often fails to meet the respiratory needs of premature newborns. Newborn rabbit pups had an oesophageal tube inserted to measure breathing pattern and were fitted with a face mask to provide non-invasive respiratory support with either CPAP or PPV similar to that received clinically by newborns. Pups were imaged immediately after delivery and at 1 hour after birth which enabled investigation of the relationship between larynx function (% time open or closed) and breathing effort Crawshaw, J. R., et al. : Laryngeal closure impedes non-invasive ventilation at birth. Archives of Disease in Childhood-Fetal and Neonatal Edition, 2018, 103(2): F112-F119.. Immediately after birth, we found that the larynx was predominantly closed in premature newborns and only opened during a breath, making non-invasive respiratory support ineffective. When the larynx (composed of the glottis and epiglottis) was closed while the newborn was receiving CPAP, the pharynx distended and air entered the oesophagus, a characteristic observation in newborns whereby the air fills the stomach resulting in "CPAP belly" (Fig 1A). When the larynx was open, CPAP was able to ventilate the lung (Fig 1B). Immediately after birth, in newborns with an unstable breathing pattern (intermittent breaths of varying rate and amplitude; Fig 2C) the larynx remained predominantly closed (only open 25.5% ± 1.1% of the time; Fig 2E) inhibiting lung aeration during CPAP, while in newborns with a stable breathing pattern (regular breaths of similar amplitude; Fig 2D) the larynx was predominantly open (76.8% ± 3.7% of the time; Fig 2E). Similarly, PPV (used when CPAP fails) was ineffective at aerating or ventilating the lung (i) when the newborn was not breathing as air entry was blocked by a closed larynx and (ii) when the pressure applied during non-invasive ventilation was too great it inhibited breathing. However, by 1 hour after birth when all newborns had aerated their lungs and established a stable breathing pattern the larynx was predominantly open (90.5% ± 1.9% of the time; Fig 2F). Taken together, these findings provide the first physiological evidence for why face mask ventilation is often not successful in non-breathing premature newborns, who then usually require intubation and mechanical ventilation. Figure 1　Phase contrast X-ray images visualising the larynx (composed of the epiglottis and glottis in the upper airway). In premature newborn rabbits receiving non-invasive respiratory support, a closed larynx results in a distended pharynx and air is directed towards the stomach via the oesophagus (A) and when the larynx is open air is able to enter the lungs (B). Figure 2　Representative phase contrast X-ray images of newborn rabbit pups demonstrating a closed larynx (A) and open larynx (B). Characteristic oesophageal pressure recording for newborn rabbit pup with an unstable breathing pattern (intermittent breaths of varying amplitude; C) and stable breathing pattern (regular breaths of similar amplitude; D). 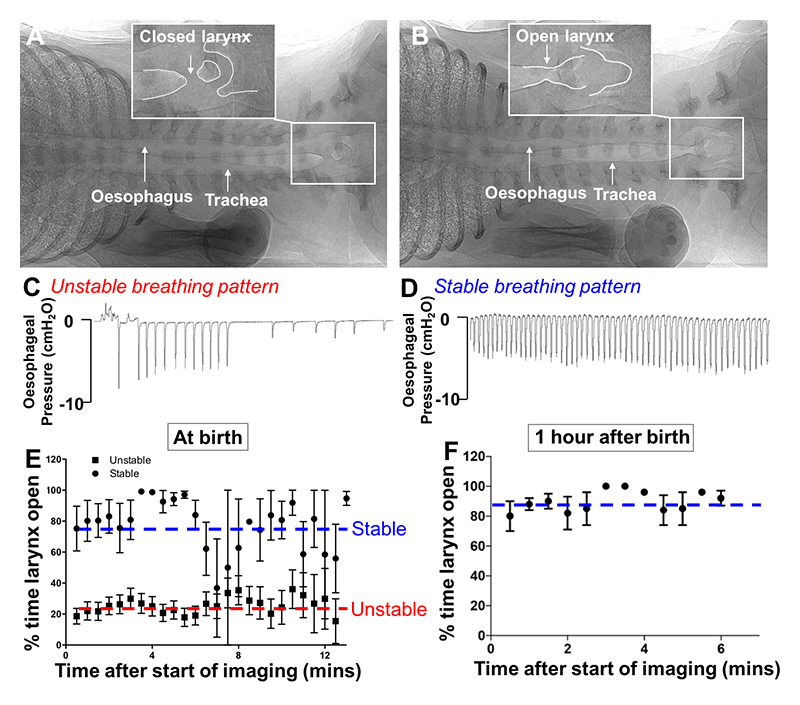 Quantification of larynx function (% time open, mean ± SEM) in newborn rabbit pups with an unstable (square) and stable (circles) breathing pattern immediately after birth (E) and at 1 hour after birth (F). To optimise non-invasive respiratory support in premature newborns, we need to identify mechanisms that promote spontaneous breathing as this will ensure that the larynx is open and will facilitate lung aeration. We have investigated 3 key areas regulating spontaneous breathing, and as such larynx function, including: (i) administration of the respiratory stimulant caffeine at birth, which is known to be safe and is currently the primary treatment for apnea (temporary cessation of breathing) of prematurity in neonatal medicine, but is currently only given hours after birth; (ii) tactile stimulation to reduce apnea; and (iii) supplemental oxygen that reduces hypoxia-induced apnea. We have shown that compared to pharmacologic agents, oxygenation and physical stimulation are the superior mechanisms to promote spontaneous breathing in premature newborns. We determined the role of oxygenation on laryngeal function and breathing pattern in spontaneously breathing premature newborns receiving CPAP using synchrotron phase contrast X-ray imaging. Newborn pups initially received CPAP with air (21% oxygen), were then switched to CPAP with 100% oxygen to stimulate breathing, to CPAP with 100% nitrogen to make them hypoxic and inhibit breathing, and finally back to CPAP with 100% oxygen. Laryngeal function was measured throughout and was found to be open 15.0 ± 5.2% of the time in air, 51 ± 24.0% of time in 100% oxygen, was predominantly closed when pups were hypoxic and spontaneous breathing decreased (only open 8.0 ± 3.7% of the time) and completely closed when breathing ceased and the pups became apneic. In the final oxygen rescue phase following hypoxia, all pups required significant physical stimulation in 100% oxygen to recommence breathing. However, with the recommencement of spontaneous breathing the larynx remained mostly open (42.1 ± 13.5% of the time). These findings highlight the key relationship between laryngeal function and spontaneous breathing and confirms that hypoxia is a potent inhibitor of spontaneous breathing, which causes the larynx to close. On the other hand, oxygen stimulates spontaneous breathing in the newborn, which promotes a predominantly open larynx, thereby allowing the lung to be ventilated with CPAP and PPV. Our findings highlight the importance of targeting interventions to support the complex physiological transition from a fetus to a newborn in the delivery room. Overall, our research is working towards providing pre-clinical evidence for the most effective approaches that can be implemented into clinical trials to support laryngeal function and improve success of non-invasive ventilation for premature newborns. The global burden of preterm birth. The Lancet, 2009, Elsevier. Dargaville, P. A., et al. : Incidence and outcome of CPAP failure in preterm infants. Pediatrics, 2016, 138(1): e20153985. van Vonderen, J. J., et al. : Effects of a sustained inflation in preterm infants at birth. The Journal of Pediatrics, 2014, 165(5): 903-908 e1. Crawshaw, J. R., et al. : Laryngeal closure impedes non-invasive ventilation at birth. Archives of Disease in Childhood-Fetal and Neonatal Edition, 2018, 103(2): F112-F119.